This algorithm is a member of the ant colony algorithms family, in swarm intelligence methods, and it constitutes some metaheuristic optimizations. Initially proposed by Marco Dorigo in 1992 in his PhD thesis, the first algorithm was aiming to search for an optimal path in a graph, based on the behavior of ants seeking a path between their colony and a source of food. The original idea has since diversified to solve a wider class of numerical problems, and as a result, several problems have emerged, drawing on various aspects of the behavior of ants. From a broader perspective, ACO performs a model-based search  and share some similarities with Estimation of Distribution Algorithms. In the natural world, ants of some species (initially) wander randomly, and upon finding food return to their colony while laying down pheromone trails. If other ants find such a path, they are likely not to keep travelling at random, but instead to follow the trail, returning and reinforcing it if they eventually find food (see Ant communication). Over time, however, the pheromone trail starts to evaporate, thus reducing its attractive strength. The more time it takes for an ant to travel down the path and back again, the more time the pheromones have to evaporate. A short path, by comparison, gets marched over more frequently, and thus the pheromone density becomes higher on shorter paths than longer ones. Pheromone evaporation also has the advantage of avoiding the convergence to a locally optimal solution. If there were no evaporation at all, the paths chosen by the first ants would tend to be excessively attractive to the following ones. In that case, the exploration of the solution space would be constrained. The influence of pheromone evaporation in real ant systems is unclear, but it is very important in artificial systems. The overall result is that when one ant finds a good (i.e., short) path from the colony to a food source, other ants are more likely to follow that path, and positive feedback eventually leads to all the ants following a single path. The idea of the ant colony algorithm is to mimic this behavior with "simulated ants" walking around the graph representing the problem to solve. Here are some of the most popular variations of ACO algorithms. The global best solution deposits pheromone on every iteration along with all the other ants. Added maximum and minimum pheromone amounts [τmax,τmin]. Only global best or iteration best tour deposited pheromone <MAZ>. All edges are initialized to τmin and reinitialized to τmax when nearing stagnation. It has been presented above. All solutions are ranked according to their length. 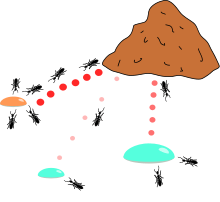 The amount of pheromone deposited is then weighted for each solution, such that solutions with shorter paths deposit more pheromone than the solutions with longer paths. The pheromone deposit mechanism of COAC is to enable ants to search for solutions collaboratively and effectively. By using an orthogonal design method, ants in the feasible domain can explore their chosen regions rapidly and efficiently, with enhanced global search capability and accuracy. The orthogonal design method and the adaptive radius adjustment method can also be extended to other optimization algorithms for delivering wider advantages in solving practical problems. It is a recursive form of ant system which divides the whole search domain into several sub-domains and solves the objective on these subdomains. The results from all the subdomains are compared and the best few of them are promoted for the next level. The subdomains corresponding to the selected results are further subdivided and the process is repeated until an output of desired precision is obtained. This method has been tested on ill-posed geophysical inversion problems and works well. For some versions of the algorithm, it is possible to prove that it is convergent (i.e., it is able to find the global optimum in finite time). The first evidence of a convergence ant colony algorithm was made in 2000, the graph-based ant system algorithm, and then algorithms for ACS and MMAS. Like most metaheuristics, it is very difficult to estimate the theoretical speed of convergence. In 2004, Zlochin and his colleagues showed that COA-type algorithms could be assimilated methods of stochastic gradient descent, on the cross-entropy and estimation of distribution algorithm. They proposed these metaheuristics as a "research-based model". A performance analysis of continuous ant colony algorithm based on its various parameter suggest its sensitivity of convergence on parameter tuning. An ant is a simple computational agent in the ant colony optimization algorithm. It iteratively constructs a solution for the problem at hand. The intermediate solutions are referred to as solution states. At each iteration of the algorithm, each ant moves from a state to state , corresponding to a more complete intermediate solution. Thus, each ant computes a set of feasible expansions to its current state in each iteration, and moves to one of these in probability. For ant , the probability of moving from state to state depends on the combination of two values, viz., the attractiveness of the move, as computed by some heuristic indicating the a priori desirability of that move and the trail level of the move, indicating how proficient it has been in the past to make that particular move. The trail level represents a posteriori indication of the desirability of that move. Trails are updated usually when all ants have completed their solution, increasing or decreasing the level of trails corresponding to moves that were part of "good" or "bad" solutions, respectively. is the amount of pheromone deposited for transition from state to , 0 ≤ is a parameter to control the influence of , is the desirability of state transition (a priori knowledge, typically , where is the distance) and ≥ 1 is a parameter to control the influence of . and represent the attractiveness and trail level for the other possible state transitions. where is the cost of the th ant's tour (typically length) and is a constant. Ant colony optimization algorithms have been applied to many combinatorial optimization problems, ranging from quadratic assignment to protein folding or routing vehicles and a lot of derived methods have been adapted to dynamic problems in real variables, stochastic problems, multi-targets and parallel implementations. It has also been used to produce near-optimal solutions to the travelling salesman problem. They have an advantage over simulated annealing and genetic algorithm approaches of similar problems when the graph may change dynamically; the ant colony algorithm can be run continuously and adapt to changes in real time. This is of interest in network routing and urban transportation systems. After each iteration, trails of pheromones evaporate. Ant colony optimization (ACO) based optimization of 45 nm CMOS-based sense amplifier circuit could converge to optimal solutions in very minimal time. Ant colony optimization (ACO) based reversible circuit synthesis could improve efficiency significantly. ACO algorithm is used in image processing for image edge detection and edge linking. The graph here is the 2-D image and the ants traverse from one pixel depositing pheromone.The movement of ants from one pixel to another is directed by the local variation of the image's intensity values. This movement causes the highest density of the pheromone to be deposited at the edges. Randomly place ants on the image where . Pheromone matrix are initialized with a random value. The major challenge in the initialization process is determining the heuristic matrix. There are various methods to determine the heuristic matrix. For the below example the heuristic matrix was calculated based on the local statistics: the local statistics at the pixel position (i,j). The parameter in each of above functions adjusts the functions’ respective shapes. The pheromone matrix is updated twice. in step 3 the trail of the ant (given by ) is updated where as in step 5 the evaporation rate of the trail is updated which is given by the below equation. Once the K ants have moved a fixed distance L for N iteration, the decision whether it is an edge or not is based on the threshold T on the pheromone matrixτ. Threshold for the below example is calculated based on Otsu's method. The above images are generated using different functions given by the equation (1) to (4). ACO has also been proven effective in edge linking algorithms too. With an ACO algorithm, the shortest path in a graph, between two points A and B, is built from a combination of several paths. It is not easy to give a precise definition of what algorithm is or is not an ant colony, because the definition may vary according to the authors and uses. Broadly speaking, ant colony algorithms are regarded as populated metaheuristics with each solution represented by an ant moving in the search space. Ants mark the best solutions and take account of previous markings to optimize their search. They can be seen as probabilistic multi-agent algorithms using a probability distribution to make the transition between each iteration. In their versions for combinatorial problems, they use an iterative construction of solutions. According to some authors, the thing which distinguishes ACO algorithms from other relatives (such as algorithms to estimate the distribution or particle swarm optimization) is precisely their constructive aspect. In combinatorial problems, it is possible that the best solution eventually be found, even though no ant would prove effective. Thus, in the example of the Travelling salesman problem, it is not necessary that an ant actually travels the shortest route: the shortest route can be built from the strongest segments of the best solutions. However, this definition can be problematic in the case of problems in real variables, where no structure of 'neighbours' exists. The collective behaviour of social insects remains a source of inspiration for researchers. 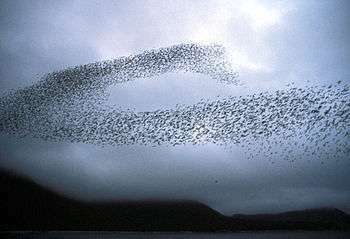 The wide variety of algorithms (for optimization or not) seeking self-organization in biological systems has led to the concept of "swarm intelligence", which is a very general framework in which ant colony algorithms fit. There is in practice a large number of algorithms claiming to be "ant colonies", without always sharing the general framework of optimization by canonical ant colonies (COA). In practice, the use of an exchange of information between ants via the environment (a principle called "stigmergy") is deemed enough for an algorithm to belong to the class of ant colony algorithms. This principle has led some authors to create the term "value" to organize methods and behavior based on search of food, sorting larvae, division of labour and cooperative transportation. Genetic algorithms (GA) maintain a pool of solutions rather than just one. The process of finding superior solutions mimics that of evolution, with solutions being combined or mutated to alter the pool of solutions, with solutions of inferior quality being discarded. Estimation of Distribution Algorithm (EDA) is an Evolutionary Algorithm that substitutes traditional reproduction operators by model-guided operators. Such models are learned from the population by employing machine learning techniques and represented as Probabilistic Graphical Models, from which new solutions can be sampled or generated from guided-crossover. Simulated annealing (SA) is a related global optimization technique which traverses the search space by generating neighboring solutions of the current solution. A superior neighbor is always accepted. An inferior neighbor is accepted probabilistically based on the difference in quality and a temperature parameter. The temperature parameter is modified as the algorithm progresses to alter the nature of the search. Tabu search (TS) is similar to simulated annealing in that both traverse the solution space by testing mutations of an individual solution. While simulated annealing generates only one mutated solution, tabu search generates many mutated solutions and moves to the solution with the lowest fitness of those generated. To prevent cycling and encourage greater movement through the solution space, a tabu list is maintained of partial or complete solutions. It is forbidden to move to a solution that contains elements of the tabu list, which is updated as the solution traverses the solution space. Artificial immune system (AIS) algorithms are modeled on vertebrate immune systems. Ant colony clustering method (ACCM), a method that make use of clustering approach,extending the ACO. 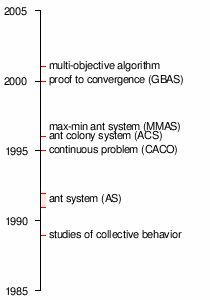 Chronology of ant colony optimization algorithms. 2005, first applications to protein folding problems. 2012, Prabhakar and colleagues publish research relating to the operation of individual ants communicating in tandem without pheromones, mirroring the principles of computer network organization. The communication model has been compared to the Transmission Control Protocol. 1 2 M. Dorigo, Optimization, Learning and Natural Algorithms, PhD thesis, Politecnico di Milano, Italy, 1992. ↑ Zlochin, Mark; Birattari, Mauro; Meuleau, Nicolas; Dorigo, Marco (1 October 2004). "Model-Based Search for Combinatorial Optimization: A Critical Survey". Annals of Operations Research. 131 (1-4): 373–395. doi:10.1023/B:ANOR.0000039526.52305.af. ISSN 0254-5330. ↑ Marco Dorigo and Thomas Stültze, Ant Colony Optimization, p.12. 2004. 1 2 M. Dorigo et L.M. Gambardella, Ant Colony System : A Cooperative Learning Approach to the Traveling Salesman Problem, IEEE Transactions on Evolutionary Computation, volume 1, numéro 1, pages 53-66, 1997. ↑ X Hu, J Zhang, and Y Li (2008). Orthogonal methods based ant colony search for solving continuous optimization problems. Journal of Computer Science and Technology, 23(1), pp.2-18. 1 2 M. Zlochin, M. Birattari, N. Meuleau, et M. Dorigo, Model-based search for combinatorial optimization: A critical survey, Annals of Operations Research, vol. 131, pp. 373-395, 2004. 1 2 3 M. Dorigo, V. Maniezzo, et A. Colorni, Ant system: optimization by a colony of cooperating agents, IEEE Transactions on Systems, Man, and Cybernetics--Part B , volume 26, numéro 1, pages 29-41, 1996. ↑ D. Martens, M. De Backer, R. Haesen, J. Vanthienen, M. Snoeck, B. Baesens, Classification with Ant Colony Optimization, IEEE Transactions on Evolutionary Computation, volume 11, number 5, pages 651—665, 2007. ↑ B. Pfahring, "Multi-agent search for open scheduling: adapting the Ant-Q formalism," Technical report TR-96-09, 1996. ↑ C. Blem, "Beam-ACO, Hybridizing ant colony optimization with beam search. An application to open shop scheduling," Technical report TR/IRIDIA/2003-17, 2003. ↑ T. Stützle, "An ant approach to the flow shop problem," Technical report AIDA-97-07, 1997. ↑ A. Baucer, B. Bullnheimer, R. F. Hartl and C. Strauss, "Minimizing total tardiness on a single machine using ant colony optimization," Central European Journal for Operations Research and Economics, vol.8, no.2, pp.125-141, 2000. ↑ M. den Besten, "Ants for the single machine total weighted tardiness problem," Master's thesis, University of Amsterdam, 2000. ↑ M, den Bseten, T. Stützle and M. Dorigo, "Ant colony optimization for the total weighted tardiness problem," Proceedings of PPSN-VI, Sixth International Conference on Parallel Problem Solving from Nature, vol. 1917 of Lecture Notes in Computer Science, pp.611-620, 2000. ↑ D. Merkle and M. Middendorf, "An ant algorithm with a new pheromone evaluation rule for total tardiness problems," Real World Applications of Evolutionary Computing, vol. 1803 of Lecture Notes in Computer Science, pp.287-296, 2000. ↑ D. Merkle, M. Middendorf and H. Schmeck, "Ant colony optimization for resource-constrained project scheduling," Proceedings of the Genetic and Evolutionary Computation Conference (GECCO 2000), pp.893-900, 2000. ↑ C. Blum, "ACO applied to group shop scheduling: a case study on intensification and diversification," Proceedings of ANTS 2002, vol. 2463 of Lecture Notes in Computer Science, pp.14-27, 2002. ↑ C. Gagné, W. L. Price and M. Gravel, "Comparing an ACO algorithm with other heuristics for the single machine scheduling problem with sequence-dependent setup times," Journal of the Operational Research Society, vol.53, pp.895-906, 2002. ↑ A. V. Donati, V. Darley, B. Ramachandran, "An Ant-Bidding Algorithm for Multistage Flowshop Scheduling Problem: Optimization and Phase Transitions", book chapter in Advances in Metaheuristics for Hard Optimization, Springer, ISBN 978-3-540-72959-4, pp.111-138, 2008. ↑ P. Toth, D. Vigo, "Models, relaxations and exact approaches for the capacitated vehicle routing problem," Discrete Applied Mathematics, vol.123, pp.487-512, 2002. ↑ J. M. Belenguer, and E. Benavent, "A cutting plane algorithm for capacitated arc routing problem," Computers & Operations Research, vol.30, no.5, pp.705-728, 2003. ↑ T. K. Ralphs, "Parallel branch and cut for capacitated vehicle routing," Parallel Computing, vol.29, pp.607-629, 2003. ↑ S. Salhi and M. Sari, "A multi-level composite heuristic for the multi-depot vehicle fleet mix problem," European Journal for Operations Research, vol.103, no.1, pp.95-112, 1997. ↑ E. Angelelli and M. G. Speranza, "The periodic vehicle routing problem with intermediate facilities," European Journal for Operations Research, vol.137, no.2, pp.233-247, 2002. ↑ S. C. Ho and D. Haugland, "A tabu search heuristic for the vehicle routing problem with time windows and split deliveries," Computers & Operations Research, vol.31, no.12, pp.1947-1964, 2004. ↑ N. Secomandi, "Comparing neuro-dynamic programming algorithms for the vehicle routing problem with stochastic demands," Computers & Operations Research, vol.27, no.11, pp.1201-1225, 2000. ↑ W. P. Nanry and J. W. Barnes, "Solving the pickup and delivery problem with time windows using reactive tabu search," Transportation Research Part B, vol.34, no. 2, pp.107-121, 2000. ↑ R. Bent and P.V. Hentenryck, "A two-stage hybrid algorithm for pickup and delivery vehicle routing problems with time windows," Computers & Operations Research, vol.33, no.4, pp.875-893, 2003. ↑ A. Bachem, W. Hochstattler and M. Malich, "The simulated trading heuristic for solving vehicle routing problems," Discrete Applied Mathematics, vol. 65, pp.47-72, 1996..
↑  S. C. Hong and Y. B. Park, "A heuristic for bi-objective vehicle routing with time window constraints," International Journal of Production Economics, vol.62, no.3, pp.249-258, 1999. ↑ R. A. Rusell and W. C. Chiang, "Scatter search for the vehicle routing problem with time windows," European Journal for Operations Research, vol.169, no.2, pp.606-622, 2006. ↑ A. V. Donati, R. Montemanni, N. Casagrande, A. E. Rizzoli, L. M. Gambardella, "Time Dependent Vehicle Routing Problem with a Multi Ant Colony System", European Journal of Operational Research, vol.185, no.3, pp.1174–1191, 2008. ↑ T. Stützle, "MAX-MIN Ant System for the quadratic assignment problem," Technical Report AIDA-97-4, FB Informatik, TU Darmstadt, Germany, 1997. ↑ R. Lourenço and D. Serra "Adaptive search heuristics for the generalized assignment problem," Mathware & soft computing, vol.9, no.2-3, 2002. ↑ M. Yagiura, T. Ibaraki and F. Glover, "An ejection chain approach for the generalized assignment problem," INFORMS Journal on Computing, vol. 16, no. 2, pp. 133–151, 2004. ↑ K. I. Aardal, S. P. M. van Hoesel, A. M. C. A. Koster, C. Mannino and Antonio. Sassano, "Models and solution techniques for the frequency assignment problem," A Quarterly Journal of Operations Research, vol.1, no.4, pp.261-317, 2001. ↑ Y. C. Liang and A. E. Smith, "An ant colony optimization algorithm for the redundancy allocation problem (RAP)," IEEE Transactions on Reliability, vol.53, no.3, pp.417-423, 2004. ↑ G. Leguizamon and Z. Michalewicz, "A new version of ant system for subset problems," Proceedings of the 1999 Congress on Evolutionary Computation(CEC 99), vol.2, pp.1458-1464, 1999. ↑ R. Hadji, M. Rahoual, E. Talbi and V. Bachelet "Ant colonies for the set covering problem," Abstract proceedings of ANTS2000, pp.63-66, 2000. ↑ V Maniezzo and M Milandri, "An ant-based framework for very strongly constrained problems," Proceedings of ANTS2000, pp.222-227, 2002. ↑ R. Cordone and F. Maffioli,"Colored Ant System and local search to design local telecommunication networks," Applications of Evolutionary Computing: Proceedings of Evo Workshops, vol.2037, pp.60-69, 2001. ↑ C. Blum and M.J. Blesa, "Metaheuristics for the edge-weighted k-cardinality tree problem," Technical Report TR/IRIDIA/2003-02, IRIDIA, 2003. ↑ S. Fidanova, "ACO algorithm for MKP using various heuristic information", Numerical Methods and Applications, vol.2542, pp.438-444, 2003. ↑ G. Leguizamon, Z. Michalewicz and Martin Schutz, "An ant system for the maximum independent set problem," Proceedings of the 2001 Argentinian Congress on Computer Science, vol.2, pp.1027-1040, 2001. ↑ O. Okobiah, S. P. Mohanty, and E. Kougianos, "Ordinary Kriging Metamodel-Assisted Ant Colony Algorithm for Fast Analog Design Optimization Archived March 4, 2016, at the Wayback Machine. ", in Proceedings of the 13th IEEE International Symposium on Quality Electronic Design (ISQED), pp. 458--463, 2012. ↑ M. Sarkar, P. Ghosal, and S. P. Mohanty, "Reversible Circuit Synthesis Using ACO and SA based Quinne-McCluskey Method Archived July 29, 2014, at the Wayback Machine. ", in Proceedings of the 56th IEEE International Midwest Symposium on Circuits & Systems (MWSCAS), 2013, pp. 416--419. ↑ S. Meshoul and M Batouche, "Ant colony system with extremal dynamics for point matching and pose estimation," Proceeding of the 16th International Conference on Pattern Recognition, vol.3, pp.823-826, 2002. ↑ H. Nezamabadi-pour, S. Saryazdi, and E. Rashedi, " Edge detection using ant algorithms", Soft Computing, vol. 10, no.7, pp. 623-628, 2006. ↑ Tian, Jing; Yu, Weiyu; Xie, Shengli. "An Ant Colony Optimization Algorithm For Image Edge Detection". ↑ Gupta, Charu; Gupta, Sunanda. "Edge Detection of an Image based on Ant ColonyOptimization Technique". ↑ Jevtić, A.; Quintanilla-Dominguez, J.; Cortina-Januchs, M.G. ; Andina, D. (2009). "Edge detection using ant colony search algorithm and multiscale contrast enhancement". IEEE International Conference on Systems, Man and Cybernetics, 2009. SMC 2009: 2193–2198. doi:10.1109/ICSMC.2009.5345922. ↑ "File Exchange – Ant Colony Optimization (ACO)". MATLAB Central. ↑ Jevtić, A.; Melgar, I.; Andina, D. (2009). "Ant based edge linking algorithm". 35th Annual Conference of IEEE Industrial Electronics, 2009. IECON '09. pp. 3353–3358. 1 2 D. Martens, M. De Backer, R. Haesen, J. Vanthienen, M. Snoeck, B. Baesens, "Classification with Ant Colony Optimization", IEEE Transactions on Evolutionary Computation, volume 11, number 5, pages 651—665, 2007. ↑ G. D. Caro and M. Dorigo, "Extending AntNet for best-effort quality-of-service routing," Proceedings of the First International Workshop on Ant Colony Optimization (ANTS’98), 1998. ↑ G.D. Caro and M. Dorigo "AntNet: a mobile agents approach to adaptive routing," Proceedings of the Thirty-First Hawaii International Conference on System Science, vol.7, pp.74-83, 1998. ↑ G. D. Caro and M. Dorigo, "Two ant colony algorithms for best-effort routing in datagram networks," Proceedings of the Tenth IASTED International Conference on Parallel and Distributed Computing and Systems (PDCS’98), pp.541-546, 1998. ↑ R. S. Parpinelli, H. S. Lopes and A. A Freitas, "An ant colony algorithm for classification rule discovery," Data Mining: A heuristic Approach, pp.191-209, 2002. ↑ R. S. Parpinelli, H. S. Lopes and A. A Freitas, "Data mining with an ant colony optimization algorithm," IEEE Transaction on Evolutionary Computation, vol.6, no.4, pp.321-332, 2002. ↑ W. N. Chen, J. ZHANG and H. Chung, "Optimizing Discounted Cash Flows in Project Scheduling--An Ant Colony Optimization Approach", IEEE Transactions on Systems, Man, and Cybernetics--Part C: Applications and Reviews Vol.40 No.5 pp.64-77, Jan. 2010. ↑ W. N. Chen and J. ZHANG "Ant Colony Optimization Approach to Grid Workflow Scheduling Problem with Various QoS Requirements", IEEE Transactions on Systems, Man, and Cybernetics--Part C: Applications and Reviews, Vol. 31, No. 1,pp.29-43,Jan 2009. ↑ Xiao. M.Hu, J. ZHANG, and H. Chung, "An Intelligent Testing System Embedded with an Ant Colony Optimization Based Test Composition Method", IEEE Transactions on Systems, Man, and Cybernetics--Part C: Applications and Reviews, Vol. 39, No. 6, pp. 659-669, Dec 2009. ↑ L. Wang and Q. D. Wu, "Linear system parameters identification based on ant system algorithm," Proceedings of the IEEE Conference on Control Applications, pp. 401-406, 2001. ↑ K. C. Abbaspour, R. Schulin, M. T. Van Genuchten, "Estimating unsaturated soil hydraulic parameters using ant colony optimization," Advances In Water Resources, vol. 24, no. 8, pp. 827-841, 2001. ↑ X. M. Hu, J. ZHANG，J. Xiao and Y. Li, "Protein Folding in Hydrophobic-Polar Lattice Model: A Flexible Ant- Colony Optimization Approach ", Protein and Peptide Letters, Volume 15, Number 5, 2008, Pp. 469-477. ↑ A. Shmygelska, R. A. Hernández and H. H. Hoos, "An ant colony algorithm for the 2D HP protein folding problem," Proceedings of the 3rd International Workshop on Ant Algorithms/ANTS 2002, Lecture Notes in Computer Science, vol.2463, pp.40-52, 2002. ↑ M. Nardelli; L. Tedesco; A. Bechini (2013). "Cross-lattice behavior of general ACO folding for proteins in the HP model". Proc. of ACM SAC 2013: 1320–1327. doi:10.1145/2480362.2480611. ↑ J. ZHANG, H. Chung, W. L. Lo, and T. Huang, "Extended Ant Colony Optimization Algorithm for Power Electronic Circuit Design", IEEE Transactions on Power Electronic. Vol.24,No.1, pp.147-162, Jan 2009. ↑ Zhang, Y. (2013). "A Rule-Based Model for Bankruptcy Prediction Based on an Improved Genetic Ant Colony Algorithm". Mathematical Problems in Engineering. 2013: 753251. ↑ Pelikan, Martin; Goldberg, David E.; Cantú-Paz, Erick (1 January 1999). "BOA: The Bayesian Optimization Algorithm". Proceedings of the 1st Annual Conference on Genetic and Evolutionary Computation - Volume 1. Morgan Kaufmann Publishers Inc.: 525–532. ↑ Thierens, Dirk (11 September 2010). "The Linkage Tree Genetic Algorithm". Parallel Problem Solving from Nature, PPSN XI. Springer Berlin Heidelberg: 264–273. doi:10.1007/978-3-642-15844-5_27. ↑ Martins, Jean P.; Fonseca, Carlos M.; Delbem, Alexandre C. B. (25 December 2014). "On the performance of linkage-tree genetic algorithms for the multidimensional knapsack problem". Neurocomputing. 146: 17–29. doi:10.1016/j.neucom.2014.04.069. ↑ P.-P. Grassé, La reconstruction du nid et les coordinations inter-individuelles chez Belicositermes natalensis et Cubitermes sp. La théorie de la Stigmergie : Essai d’interprétation du comportement des termites constructeurs, Insectes Sociaux, numéro 6, p. 41-80, 1959. ↑ J.L. Denebourg, J.M. Pasteels et J.C. Verhaeghe, Probabilistic Behaviour in Ants : a Strategy of Errors?, Journal of Theoretical Biology, numéro 105, 1983. ↑ F. Moyson, B. Manderick, The collective behaviour of Ants : an Example of Self-Organization in Massive Parallelism, Actes de AAAI Spring Symposium on Parallel Models of Intelligence, Stanford, Californie, 1988. ↑ M. Dorigo, ANTS’ 98, From Ant Colonies to Artificial Ants : First International Workshop on Ant Colony Optimization, ANTS 98, Bruxelles, Belgique, octobre 1998. ↑ T. Stützle, Parallelization Strategies for Ant Colony Optimization, Proceedings of PPSN-V, Fifth International Conference on Parallel Problem Solving from Nature, Springer-Verlag, volume 1498, pages 722-731, 1998. ↑ É. Bonabeau, M. Dorigo et G. Theraulaz, Swarm intelligence, Oxford University Press, 1999. ↑ W.J. Gutjahr, A graph-based Ant System and its convergence, Future Generation Computer Systems, volume 16, pages 873-888, 2000. ↑ S. Iredi, D. Merkle et M. Middendorf, Bi-Criterion Optimization with Multi Colony Ant Algorithms, Evolutionary Multi-Criterion Optimization, First International Conference (EMO’01), Zurich, Springer Verlag, pages 359-372, 2001. ↑ L. Bianchi, L.M. Gambardella et M.Dorigo, An ant colony optimization approach to the probabilistic traveling salesman problem, PPSN-VII, Seventh International Conference on Parallel Problem Solving from Nature, Lecture Notes in Computer Science, Springer Verlag, Berlin, Allemagne, 2002. M. Dorigo, 1992. Optimization, Learning and Natural Algorithms, PhD thesis, Politecnico di Milano, Italy. M. Dorigo, V. Maniezzo & A. Colorni, 1996. "Ant System: Optimization by a Colony of Cooperating Agents", IEEE Transactions on Systems, Man, and Cybernetics–Part B, 26 (1): 29–41. M. Dorigo & L. M. Gambardella, 1997. "Ant Colony System: A Cooperative Learning Approach to the Traveling Salesman Problem". IEEE Transactions on Evolutionary Computation, 1 (1): 53–66. M. Dorigo, 2007. "Ant Colony Optimization". Scholarpedia. Mohd Murtadha Mohamad,"Articulated Robots Motion Planning Using Foraging Ant Strategy",Journal of Information Technology - Special Issues in Artiﬁcial Intelligence, Vol.20, No. 4 pp. 163–181, December 2008, ISSN 0128-3790. N. Monmarché, F. Guinand & P. Siarry (eds), "Artificial Ants", August 2010 Hardback 576 pp. ISBN 978-1-84821-194-0. A. Kazharov, V. Kureichik, 2010. "Ant colony optimization algorithms for solving transportation problems", Journal of Computer and Systems Sciences International, Vol. 49. No. 1. pp. 30–43.